As a worldwide leading manufacturer of instruments for temperature measurement, we offer you a wide range of products. As well as standard products, you will also find customer-specific solutions from us. Our certified measuring instruments meet the highest standards of quality and safety, offer worldwide approvals and comply with almost all international directives. The following temperature measuring instruments, due to their simple, robust and cost-effective design, are frequently used for industrial measuring tasks. They find their application, for example, in the heating, ventilation and air-conditioning industry, in machine building, plant, vessel, pipeline and apparatus construction, and in the chemical and petrochemical industries. With WIKA you have the complete range of measuring instruments for electrical temperature measurement: Thermocouples, resistance thermometers, temperature switches and temperature transmitters. The core of all measuring instruments for electronic temperature measurement is a sensor, which converts the measured temperature into an electrical signal. A thermocouple consists of two wires of different material, welded together. The welding point represents the actual measuring point. With a resistance thermometer, the measured resistance changes depending on the temperature. In WIKA resistance thermometers, platinum resistors (Pt100 and Pt1000) are used. Temperature switches, along with the temperature measurement, give control and analogue output signals to the process. Temperature transmitters are either mounted on a DIN rail in a control cabinet or in a connection head directly at the measuring point. 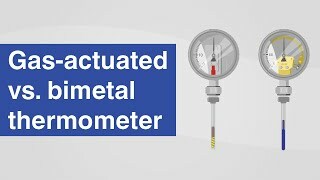 The WIKA range of measuring instruments for mechanical temperature measurement comprises bimetal, gas-actuated and expansion thermometers. These are all based on the expansion of temperature-dependent materials. The basis of a bimetal thermometer is composed of two bonded metal strips with differing expansion coefficients. The bending resulting from this is the measure of the temperature. 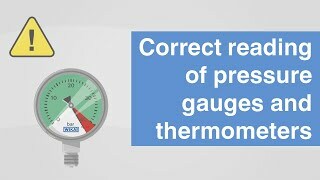 Gas-actuated thermometers are filled with an inert gas or gas mixture. The temperature-dependent change in the gas pressure leads, via a capillary, to the temperature display. Expansion thermometers contain a liquid-filled measuring system which also generates a pressure change when the temperature changes, and this is then displayed via an integrated movement. Measuring instruments for mechatronic temperature measurement have additional equipment such as alarm contacts and switch contacts. If a pre-defined measured value is reached, a switching operation is triggered. With the transmitted output signal, measuring instruments for mechatronic temperature measurement can be used for control and regulation processes. The WIKA range includes measuring instruments for mechanical temperature measurement with electrical output signals or with switch contacts and mechanical temperature switches.